LasVegas.Net Hotel, opening soon, is a boutique hotel with two towers. Its West Tower is located at 2601 Westwood Drive in Las Vegas, and East Tower at 2651 Westwood Drive. The Hotel is near both Downtown Las Vegas and the Strip. 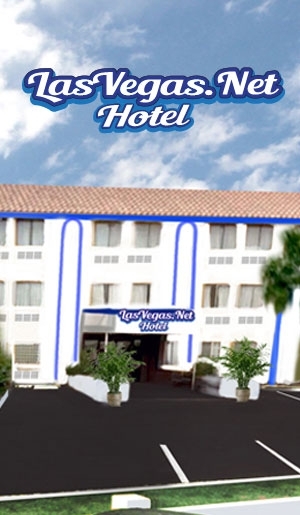 LasVegas.Net Hotel is a lodging alternative to the areaÂ’s large resorts, offering the familiarity and comfort found in a small style inn. The Hotel has upgraded the premisesÂ’ internet access capabilities, making it one of the highest bandwidth hotels in Las Vegas. Its mobile friendly website allows the same functionality as a personal computer. Visitors to Downtown Las Vegas or the Strip will find LasVegas.Net Hotel is an ideal alternative to other surrounding hotels, with comparable amenities. LasVegas.Net Hotel serves a clientele of business and leisure travelers from the United States and around the world, including tradeshow attendees, entrepreneurs, and executives from technology centric companies. The HotelÂ’s premises have recently been expanded to include 138 rooms in all, introducing standard and executive level suites. Guestrooms, Standard Suites, and Executive Suites are 250 square feet, 400 square feet, and 525 square feet respectively. Rooms are decorated in a contemporary style. The Hotel has remodeled its pool, adding a Jacuzzi and spa. LasVegas.Net Hotel overlooks a prominent 100 foot marquee sign that faces the interstate near Sahara Avenue. The sign bears the HotelÂ’s name featuring a 4,600 square foot LED TV billboard operating non-stop 24/7. LasVegas.Net Hotel has a restaurant located near the pool. It provides takeout, dine-in, and in-room service. Reservations at the HotelÂ’s restaurant can be made online through LasVegas.Net HotelÂ’s partnership with OpenTable. A full service bar is available. It offers spirits, domestic & imported beers, wine, and non-alcoholic drinks. LasVegas.Net Hotel has a gaming area and retail shopping, in addition to non-gaming entertainment. Meeting facilities and related services are available.